Jasmine oil nicknamed “queen of the night” is derived from the jasmine flower that has a strong small at night. Known to be the most popular oil for improving mood, balancing hormones and low libido. It’s “seductive” strong scent is a natural aphrodisiac that can increase sensuality and has libido-boosting qualities. The post How Essential Oils and Aromatherapy Can Improve One’s Health appeared first on http://www.yourfootpalace.com. The new year is just around the corner; everyone is gearing up for the holiday cheer. As we all know too well after all the cheer comes the next morning that can be quite debilitating. You wake up with a throbbing head, heavy eyes, a stomach ache, and the feeling of a cloud hanging over your head. We’ve all heard about the standard hangover cures – a glass of water before bed, exercise to sweat it out, hair of the dog. Everyone seems to claim that one thing will rid you of a hangover, but have you ever tried a reflexology massage? A Reflexology session is a sure-fire way to get you up and going after a binger the night before. How does it work and why should you give it a go? Reflexology is known to relieve a slew of ailments and hangovers are no exception. A reflexology session is a great natural way to relieve the effects of being over served. There is 5 key reflex points that once stimulated will have you perked up and feeling better in no time. Liver; helps the body to flush out the remaining toxins. Kidneys; to help filter and eliminate the alcohol. Stomach; reduces the nausea and tummy ache. Head; relieves the throbbing, pounding headache. Solar Plexus; brings your body back to a neutral center ground. By stimulating these 5 key points your body will get the boost it needs to overcome the dreadful hangover. To cure that dreadful hangover and get your body back to its senses you’re in need of reflexology relief! If you just can’t muster to get out of bed and make it to the spa you can try to target the most important pressure point to get some relief, the liver. Press and rub the outer edge of your right foot, halfway between the middle of your foot and your pinky toe. When pressing on this area you may notice they are “crunchy” this is a sign that congestion is in the area. Continue to press and rub until this feeling dissipates. Stimulating these pressure points will sure get your blood moving to help your body eliminate all the poison you consumed but not without the help of H2O. Hydration is key after a reflexology session hungover or not to help your body flush out the toxins just released from pressure points. 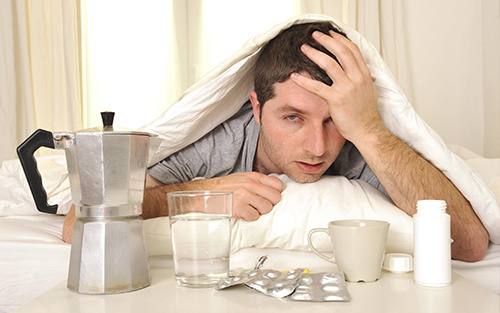 No one likes a hangover, but it happens to the best of us. Next time you get a little “extra” Happy at happy hour just know, you don’t have to suffer the next day. Whether fighting the flu or a hangover, holistic treatments work, so give it a try and see the magical relief for yourself. The post Five Points to a Holistic Hangover Cure appeared first on http://www.yourfootpalace.com. The post How Our Wellness Therapists Fight the Flu and Stress appeared first on http://www.yourfootpalace.com. 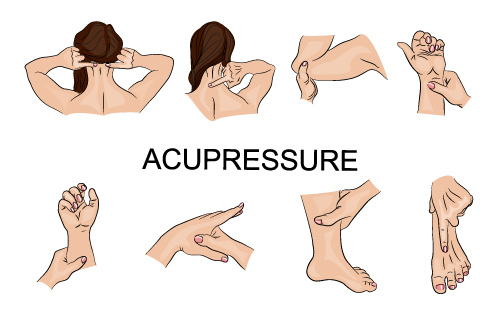 The post Acupressure Therapy – The Basics, Benefits, and Techniques appeared first on http://www.yourfootpalace.com. The post My Dogs Are Barking! – Translation, My Feet Hurt appeared first on http://www.yourfootpalace.com. There has been a lot of controversy about the detox foot spa and many claims have been made. These claims range from helping with insomnia to curing serious diseases like heart disease or cancer. The naysayers claim that the foot detox spa is a fraud and has no basis in science. As I see it reality usually is somewhere in the middle and the foot detox spa is no different. The detox foot spa is also known as the ionic cleanse, aqua chi, ion foot bath and others. In a typical session the patient places their feet in warm salt water and an electrical array is turned on creating electrolysis in the water. This electrolysis causes an electro-magnetic field in the water which pulls toxins and heavy metals into the water through the sweat glands in the feet. During the session, the water changes colour, bubbles and little chunky floaters apear. The foot bath is usually finished by washing the feet and a relaxational foot massage is performed using a natural anti-bacterial, anti-fungal and anti-viral cream. In general, people report feeling more energized, lighter, more mental focus, and an improved mood. Many patients also report dramatic improvements in sleep. Some report improvements in serious health concerns. But is it a fraud? Is it another example of the placebo effect? Or are there legitimate health benefits to this therapy? Lets begin with the colour of the water. Many distributors and marketers of these devices claim that the water colour indicates where in the body the toxins have been drawn from. If it is one color it is coming from your pancreas if it is another it is your liver. This kind of analysis has no basis in science. There is no scientific way (that I know of) of determining where the toxins are coming from by the colour of the water. In fact, the water will change colour if no feet are present during a session. Also, I have seen youtube videos of foot spa sessions with a carrot or a piece of cellery in the water. The person making the video claimed that he had proved that the carrot has a liver based on the colour of the water! The colour of the water is meaningless. The content of the water is what counts. And a laboratory analysis of the water is the only way to determine the content. Now the question is: What about heavy metals? If the detox foot spa draws heavy metals out of the body then there should be metal in the water. But could it be the metal array itself that is releasing the metal particles into the water? Maybe. At least two marketers or distributors of detox foot spas have run lab analysis comparing sessions with no feet to four or five different sessions with feet from different subjects. In both studies the laboratory results indicated significantly more heavy metal content in the test subjects relative to the control session. Some subjects had dramatically increased levels. So, insofar as we can trust the results of these studies, it appears that the detox foot spa does help with heavy metal detoxification. I have had a few sessions in the foot detox spa and every time I sleep better and feel more relaxed. I have observed many people use the treatment and almost all of them have reported a positive experience with improvements in their health and well being. A few have experienced major improvements. How one can identify your kidney in the water based on the colour is a mystery to me but one thing is sure. If you enjoy the session and feel better as a result it certainly is worth the time and money spent. So if you decide to try it, relax and enjoy the experience!